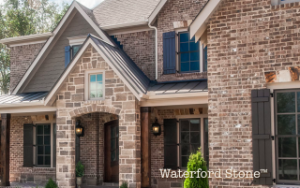 Like Dufferin®, Waterford Stone looks exactly like a real stone veneer. Sophisticated yet casually elegant, Waterford’s surfaces evoke hand-cut stone while its edges are antiqued for a time-worn look. Available in an array of sizes, Waterford affords unparalleled design freedom; the entire collection’s broad range of colors employ our unique multiple color blending system, for color that will last for the life of your home. Waterford veneers are also a fitting choice for any architectural style, from a Georgian in Greenwich to a Ranch in Rancho Mirage.